*Results can vary depending on area being treated, dilution ratio and sprayer setting. Most products are shipped via USPS Priority Mail or UPS. Please allow 2-6 business days (M-F) for delivery. Items ordered after 4:00 PM pacific time or during a weekend will go out the next business day. If you need product overnight or rushed please call for turn times and additional costs as multi gallon or "rush orders" will incur additional shipping charges. Orders in Southern California "should" be delivered within 1-2 business days. Orders within the Pacific Time zone "should" be delivered within 2-3 business days. Orders within the Mountain Time zone "should" be delivered within 2-3 business days. Orders within the Central time zone "should" be delivered within 3-4 business days. Orders within the Eastern Time zone "should" be delivered within 3-4 business days. "Business days" are considered Monday-Friday. All above posted shipping times are "best estimate" standard delivery guidelines as stated by the USPS and are not guaranteed by the USPS or LawnLift™. Only those who call in and pay for guaranteed overnight shipping will have a guaranteed delivery date. Please be sure the shipping times posted above will work before ordering. For faster delivery times please call for turn times and cost. Returns and refunds are granted for damaged product that occurred during shipping. A damaged goods claim from USPS or UPS is required so please obtain a valid report number prior to contacting us. Due to quality control concerns LawnLift™ does not grant refunds or accept returns on opened items, so please be sure that you will use the product before ordering. Only Items that are unused and unopened may be returned within 30 days of original purchase date. All returns will incur full shipping fees both ways and a 20% re-stocking fee. Receive instructions on how to use our array of products. LawnLift™ is now available for resale! 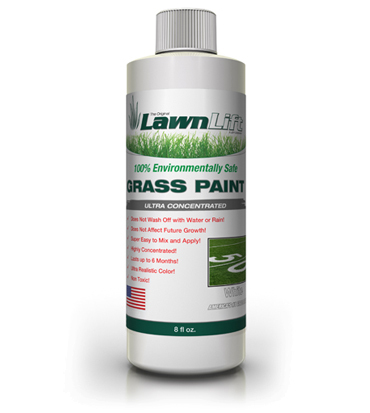 Our Grass and Mulch Paints make a perfect addition to the garden section of any home improvement or hardware store! Summer heat, overzealous fertilization, dog urine….